Our pet of the month is Belinda! Belinda has been selected as our pet of the month! Belinda came to us with a bilateral mandibular fractures. It was easy to see she was very malnourished and her jaw had been fractured for a few days. We repaired her jaw with a figure eight wire and a splint. 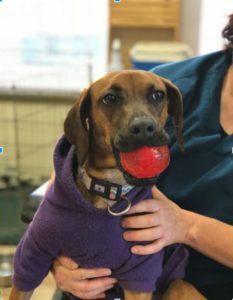 One side of Belinda’s splint broke and her jaw had a small piece of dead bone and a non union, so she needed more surgery to heal. Belinda returned to us from Fresno, California to have her splint adjusted and repaired. Out of the kindness in her heart, Dr. Force decided to foster Belinda for the remaining time of her recovery. After two more months, multiple adjustments, and lots of love, Belinda’s jaw recovered better than expected and for a short time became part of the Dentistry for Animals team. Belinda is now happily adopted and enjoying her new home! Leo – Our Pet of the Month! Patient of the Month – O.J.